A top-level summary till now.. This is a top-level summary of my understanding in Aditya Hrdayam series till now.. This is a work-in-progress. Hiranyagarbha is four dimensional spacetime. Spacetime is the ‘inert’ (Hiranya) ‘uterus’ (garbhah) in which Universal matter evolves. This four dimensional Hiranyagarbha or spacetime is the surface that gives and bears the Universe. On it the 'rudras' or 'force-fields' manifest. It is in these rudras or force-fields that energy, mass and particles that make the Universe manifests. It is the interaction of these force-fields filled with energy and mass (impeding motion) that complex matter forms. Brahma refers to expanded spacetime (post cosmic inflation). In this expanded spacetime (Brahma), rudras (force-fields) manifest. In these force-fields Shiva (enery) or vishnu (mass) or a mixture of it manifest. Puranas say that svayambhu established primordial waters, created the initial seed, entered into it and the seed became the Hiranya-garbha in which Universe evolves, Standard model today says that after Big-Bang, energy(may be something more than energy whose nature we don't know today) and spacetime (seed) got established first and then the spacetime expanded greatly, became the 'womb' in which Universal matter evolves. sa dādhāra pṛthvīṃ dhyāmutemāṃ kasmai devāyahaviṣā vidhema(gives, bears all the prthvi, dyaus ; for/to whom we offer the oblations). The evolution of Universe is a Yajna or sacrifice. One form of matter is sacrificed (offered as oblations, havis) to build more complex forms of matter. All the oblations/offerings in this Yajna are offered to this Hiranyagarbha, the spacetime, as it is what holds all the matter and bears the Yajna. What is the nature of this Hiranyagarbha or four-dimensional spacetime..? From a science view, we don't know much about it except that the three dimensional space and whatever we perceive as time are actually a continuum and are in fact a four dimensional spacetime. We also know that there is Cold Dark Matter in the Universe which is nearly 2/3rd of overall mass of Universe (similar to the Purusha desribed in vedas). In fact I map Purusha to this cold dark matter (and matter combination) in standard model. But if my understanding of Vedas and Upanishads and their mappings to science is right, then Brahma (expanded spacetime) bloomed from the navel of Narayana. Narayana is Maha-Vishnu (Higgs field) and Purusha (Dark matter) combined together. Probably there is a Unified field of Higgs and Dark Matter (which is the Naryana) (such theories are being discussed now), that existed during the Big-Bang. Shortly after Big-Bang in which huge energy got released, during the cosmic inflation epoch, the Unified field separated and Higgs field expanded greatly causing the expansion of spacetime. The inflated spacetime (Brahma) is filled with Purusha or dark matter. That's how that Narayana is said to have created the seed and also entered in it making it a womb (as we saw in that sloka). That cosmic inflation could have been driven by Higgs field or a unified field related to Higgs is my supposition from the reading of vedic texts. It is psuedo-science at this point. Whether we believe the Puranas that say Brahma bloomed out of Maha-Vishnu or not, current models indicate that spacetime indeed expanded greatly, shortly after the Big-Bang. May be I am totally wrong. This Narayana is same as the Shankara. When seen as a Rudra in which energy travels it is Shankara. When seen as a Rudra or force-field in which mass manifests (energy is impeded), it is nArayana. Since nArayana (Unified field of Higgs and Dark matter) expanded the spacetime in cosmic inflation epoch, Brahma is understood to have born out of the navel of nArayana. All matter particles with mass also come out of the Higgs field interaction and hence Lakshmi is also said to have come out of navel/center of Vishnu. Purusha, the cold dark matter is the 'bed' on which the Universe evolves according to the vedic texts. Its role is to protect the Yajna or sacrifice or evolution of Universe and its matter. The fifth head of Brahma..? I can go one more step and propose that Brahma is not four dimensional, but five dimensional. The fifth head of Brahma or fifth dimension is plucked out by expanding energy/Shiva (as kAla Bhairava). Hence fifth dimension remains a shortened dimension causing probably quantum entanglement. Einstein had actually proposed a shortened fifth dimension, but did not work out the mathematics for it. On this Hiranyagarbha, eleven Rudras or force-fields emerge at different points of time. They ae Strong force field (vAmadeva Rudra or soma Rudra), Weak force field (Aghora Rudra), Electromagnetic field (Pingala Rudra), Electroweak force-field (Tatpurusha), Electroweakstrong (iSAna Rudra), Higgs field (Hara Rudra), force-field of Dark Matter (kapAli Rudra), Unified field of Dark Matter and Higgs (Ahirbudhnya,Shankara, Narayana), Dirac Fermi in which quarks, electrons, neutrinos manifest (Tryambaka), Dark energy scalar field (nRRti Rudra), Quantum entanglement (kapArdi). Each one of these Rudras have multiple names. The eleven force-fields are called ‘catuspada’ or four legged beings as they manifest in four dimensional spacetime (not all of them in my view, but more on that later). In these four-legged force-fields, two-legged beings (particles with distinct anti-particles) appear. They are called dvipada. Some of the particles are their own anti-particles. They are the ekapAda. These particles and anti-particles interact with each other, create bigger ‘ganas’ or ‘sets’ of atoms which then create molecules, compounds and biological life. Energy that manifests in all the force-fields comes from a scalar field, nirrti rudra, (as in the quintessence model). This energy is called Shiva. Energy from this nRRti Rudra or scalar field as in quintessence model settles down as ‘Agni’ in other force-fields. Agni is similar to ‘Wave-function’ of quantum physics in describing a force-field interaction. ‘Maruts’ are the particle nature that manifest in these force-fields. Hence Maruts are said to be ‘sons’ of Rudras and Agni is said to be horipilation of Rudra. Particles (particle nature of force-field/rudra) that have energy (Shiva) move across the spacetime fabric (Brahma) at speed of light. The Higgs field (Hara Rudra) impedes the motion of particles, if particles have the ability to interact with this Higgs field (Maha-Vishnu). Such particles are said to have acquired the property of ‘mass’. If Vishnu is mass, all particles in the Universe that possess mass is Lakshmi. Hence Lakshmi is wealth of the Universe. Lakshmi/particles is the ‘Sign’ of Vishnu (mass). There are two types of Lakshmis/particles in the Universe. Particles that interact with Electromagnetic field, the Shri-Devi, which are visible and radiant. Particles that do not interact with Electromagnetic field, which bears other particles and called Bhu-devi. The Brahma (expanded spacetime) bends to the 'energy' or shiva (and also vishnu or mass) and hence is called 'Ka-ancha'. This is called warping of spacetime, which we perceive as 'gravity'. Of these in the Tryambaka Rudra (Dirac-Fermi field that produces quarks, electrons and neutrinos), shiva (energy) and vishnu (mass) manifest together and the universe is made of their interactions. The interactions of nRRti (dark energy scalar field) and Tryambaka Rudra (Dirac fermion field) and Hara (Higgs field) which gives rise to Quarks, Electrons and neutrinos, forms the three quarked baryons (Indra) and quark-antiquark mesons (varuna), quark pairs (mitra). When Indra (baryons) drink the soma (strong interaction) and throws his vajra (residual nuclear force) on vrtra (sea quarks), the nucleus of atoms (hrdi) is formed and is called Big Bang nucleosynthesis. If Shiva is energy, Shakti is Momentum. Energy is characterized by momentum. They cannot be separated. Hence Ardha nareeswara. Energy and Momentum are related by an equation (E2 = (m2c4 + p2c2)which forms a hyperboloid called the Linga. Those particles that lie on the Linga (on-shell) are the 'nara' or ‘real’ particles that create the universal matter. Those that do not lie on it are virtual (off-the-shell) or the 'manas'. Real particles are observable and make the Universe. They obey the laws of physics as we see it in the Universe. Virtual particles are our theory or modeling. They don’t obey the laws of physics. For eg they travel faster than the speed of light. They don’t exist or we can’t see them existing. For eg. virtual (manas) pions (varuna) bind the nucleus of atoms as they are seen as the ones facilitating the residual nuclear force (vajra) and thus slaying the sea-quarks (vrtra). Thus the ‘heart’ (hrday) of the atom is said to have virtual particles (manas). Similarly virtual photons (Apa) are seen as mediating the Electromagnetic field. What is behind this Narayana (Unified field of Dark matter and Higgs) and Shiva (energy) and Brahma (spacetime) is referred to as 'Atma' at several places. I translate Atman as At-manas. Nara are real particles, that are on-shell, that satisfy energy-momentum relationship, that obey the Universal laws that exist today. 'Manas' are virtual particles that are off-the-shell, that do not obey the Universal laws. They are 'virtual' because they are our theoretical models and cannot be proved to exist. But without this virtual particles, our understanding of Universe is not complete. We need them to 'bind' the real particles in our models at different places. If manas is virtual, At-manas is extremely virtual. From this extremely virtual Atman, it seems that whatever we perceive as shiva, narayana, Hiranyagarbha seems to have come. Because it is extremely virtual and its nature not known or can only be partially known, we can partially identify it with anything that we perceive and we won't be able to fully identify with anything we perceive. 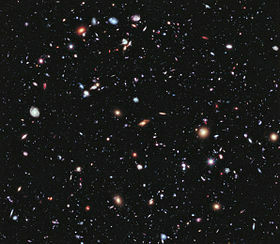 The physics of the pre-big-bang Universe is different from the physics of Universe post the Big-Bang. Hence we may not know what it is for sure or we may get to know only partly. That's exactly what Nasadiya suktam says. In essence Vedas are cosmic science. From it comes the models of SaMkhya with purusha, prakrti and gunas. Models of saMkhya beautifully explain how from these particles, an ‘ahamkAra’ gets created, how beings evolve and how the gunas operate in all domains from quantum physics to social structures such as Varna dharma.